There’s a great scene in season 6 of The West Wing when Josh Lyman introduces Matt Santos to the unglamorous reality of kicking off a presidential campaign from scratch with the New Hampshire primary. The candidate helps voters unload their trash at the town dump. The scene reinforces the importance of humility in politics. Personal connections are important. And to go a bit ‘cluetrain’: politics is conversations. That’s why I’m glad I took this snap last Saturday. Labour types had been out canvassing in Hanover for several hours and one activist had met some teachers who asked some probing questions and raised some prescient concerns on the doorstep. 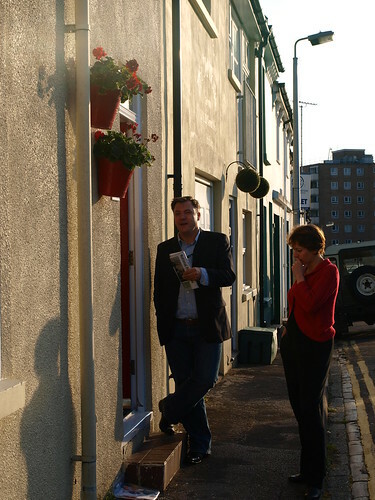 A few streets away, Children’s Secretary Ed Balls was meeting other voters. Nancy Platts (Labour’s parliamentary candidate round these parts) heard about the teachers and suggested to Ed that he pop back to see them. He was game. The rest of the doorknockers were ensconced in the pub for a well deserved pint by the time I took this picture. The Secretary of State spent about fifteen minutes talking to the teachers with Nancy as the sun started to set. Sometimes real politics happens in the quiet moments.